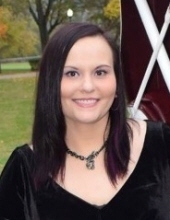 Amanda Renee (NeNe) Floyd, 35, daughter of Mitchell Floyd & Barbara Kay (Thompson) Floyd of Georgetown, Kentucky, passed away Wednesday, January 30, 2019 in Lexington, Kentucky. She was born on September 14, 1983 in Middlesboro, Kentucky. Amanda was a former substitute teacher for Scott County Schools. Along with her parents, she is survived by her sister, Kayla Floyd King, brother-in-law, Tom King, precious nephew she loved so much, Harrison Lee King, and grandfather, Herschel Thompson, all of Georgetown, Kentucky. Amanda is also survived by aunts and uncles, Karen & Tim DuVall, Leisa & Len Miracle, Tim & Sharon Floyd, and Brent & Lori Floyd, cousins, Josh & Cherub DuVall, Nicole Miracle Levy, Brandon & Alex Floyd, Mason & Hayley Floyd, and DJ Dorris. Plus lots of other cousins whom she loved very much. Best friend Niki Jackson Stephens. Her special furbabies, Dexter Buster Floyd, Sylvia Prickles, Skuttle, Miss Kitty, Fritz, and Holly & Elsa. Amanda was preceded in death by her grandmother, Martha Thompson, grandparents, Billy Joe & Billie Jean Floyd; great grandparents, Willie & Pete Vinoski, and Ruth & George Owens, and great grandmother, Ida Woods. To send flowers or a remembrance gift to the family of Amanda Renee (NeNe) Floyd, please visit our Tribute Store. "Email Address" would like to share the life celebration of Amanda Renee (NeNe) Floyd. Click on the "link" to go to share a favorite memory or leave a condolence message for the family.